Scans and Transcriptions will added to these tables as they are completed. 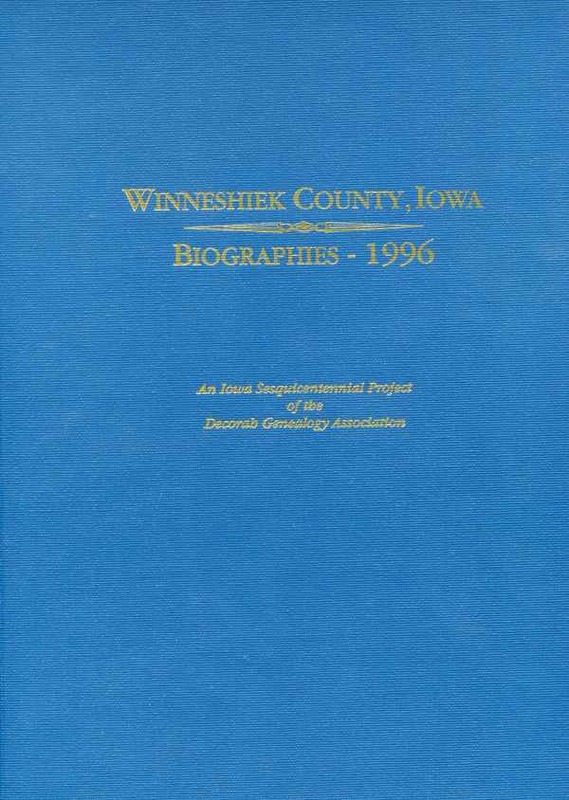 This comprehensive book of Winneshiek County biographies was published by the Anundsen Publishing Company in 1996. The compilation of these biographies was an Iowa Sesquicentennial Project of the Decorah Genealogy Association. As stated on page ii of the introductory pages, “to facilitate the use of this information, no part has been copyrighted”. In October, 2014, your coordinator started to scan and transcribe this excellent source of Winneshiek County genealogy information. These scans and transcriptions will be posted as they are processed. Your coordinator has observed that many of the Biographies that were published in the original book contained extensive sensitive personal information about currently living individuals. Since search engines do not search scans but do search transcribed material, your coordinator has decided to post complete compressed scans of the published information, but to limit the transcription of sesitive personal information to deceased individuals. The index will be complete, but some transcriptions will be completely missing, others with large portions missing and still others with just one or two birth dates missing. These pages will contain links to the information as it is scanned, transcribed and posted.